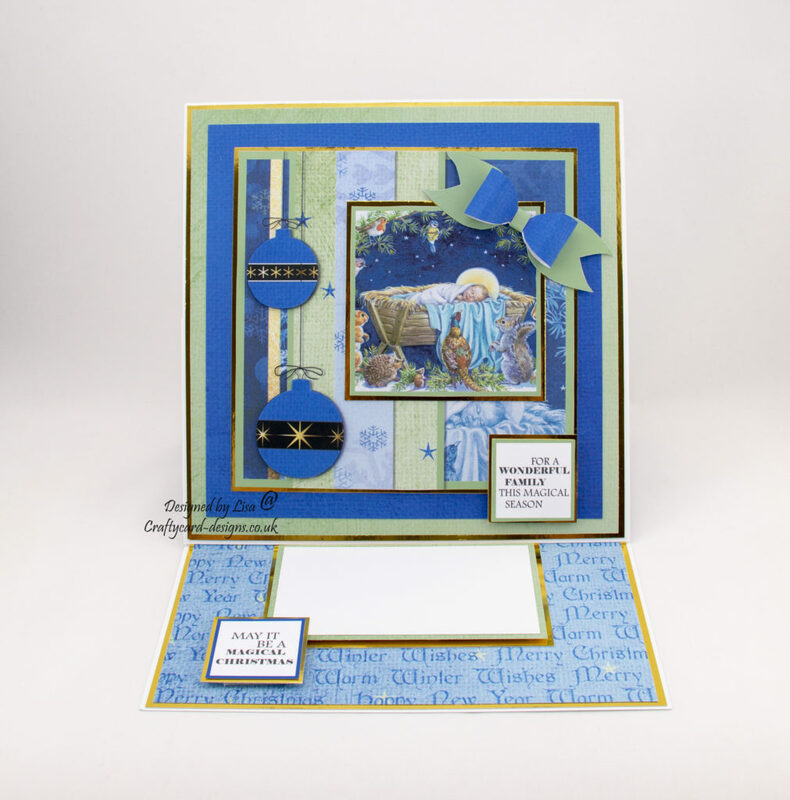 Today’s handmade easel card has been created using ‘Once Upon A Christmas volume II’ dvd-rom by Audrey Tarrant from Creative Crafting World. Click on set four on the dvd-rom and then select toppers and stackers. Select the second image sheet and print. Go to backing papers and select paper seven, paper twenty two and paper twenty three and print. Cut out all the elements on the image sheet. Make the bow up and put to one side to dry. Score the card base front at 10 cms and fold. This will make an easel shape card base for this design. Cut a square from gold mirri card measuring 20 cms by 20 cms and a square from paper seven measuring 19.5 cms by 19.5 cms. Matt and layer together and attach to the base of the card. Cut a square from white card measuring 20.3 cms by 20.3 cms and a square from gold mirri card measuring 20 cms by 20 cms. Next cut a square from paper twenty three measuring 19.5 cms by 19.5 cms and a square from paper twenty two measuring 18 cms by 18 cms. Matt and layer all these squares together and then attach to the front fold of the card base. Cut a square from gold mirri card measuring 15.7 cms by 15.7 cms. Matt and layer this with the main topper image. Cut a square from gold mirri card measuring 9 cms by 9 cms. Matt and layer this with the smaller topper image using foam pads and attach to the main topper image. Attach this layer to the card base. Next attach the bow to the top right of the smaller topper image and add the baubles to the main image using foam pads. To make a stopper for the front of the card cut a piece out of gold mirri card measuring 12 cms by 7 cms, a piece out of paper twenty three measuring 11.5 cms by 6.5 cms and a piece out of white card measuring 11 cms by 6 cms. Matt and layer paper twenty three and the white card together using double sided tape and then attach both to the gold mirri card using foam pads. Attach this layer in the middle of the bottom of the card base to form a stopper. 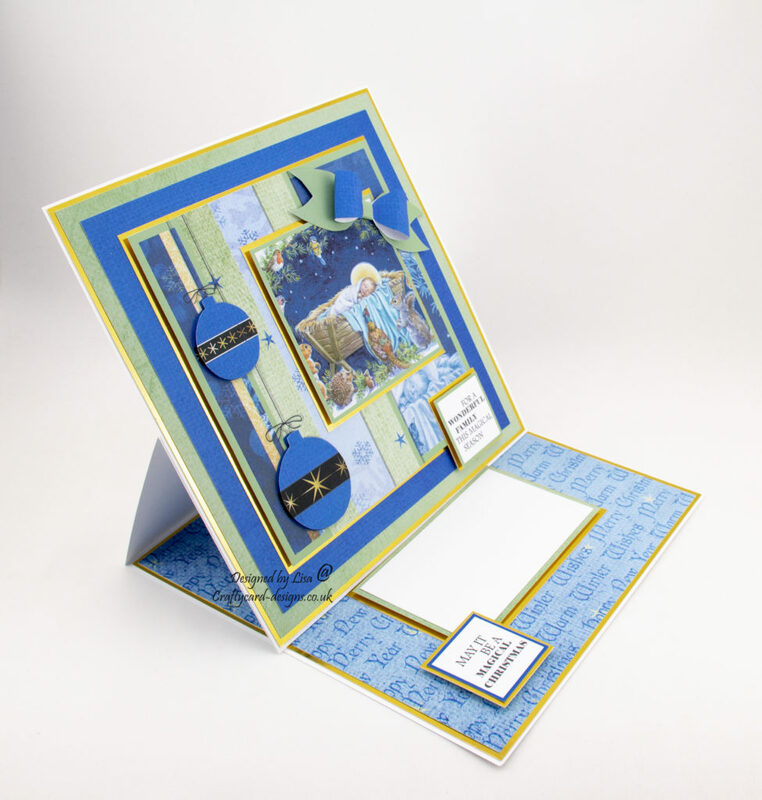 To finish off cut two matt layers out of gold mirri card for the square sentiments. Attach together using foam pads and then attach one to the topper and one to the base of the card. Please see picture for reference. This design can be made with any papers or cd’s. Please feel free to leave a comment and let me know you’ve visited.